After a big business update last week Brian and Jordan are digging into a handful of things that are going on in their businesses. Putting the typical logistical pains of running a business aside, it’s been a very productive week, and the guys are running on all cylinders. 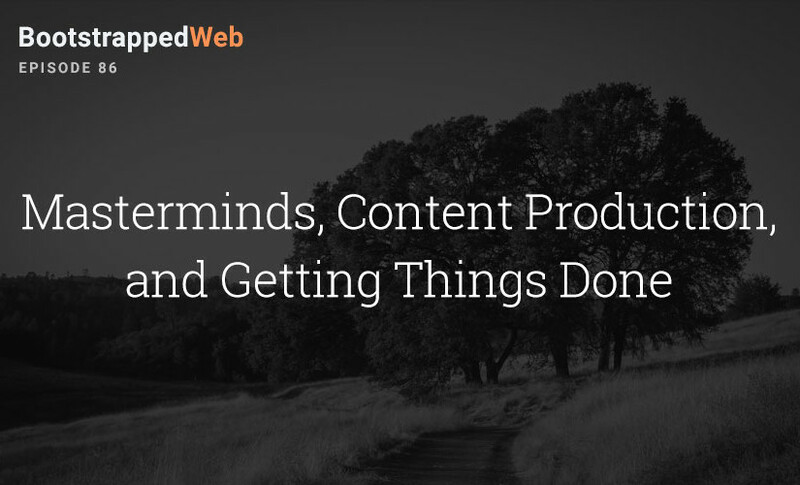 Today they cover 4 topics: Masterminds, Content Production, Getting Things Done, and Work/Life Balance. Let’s dig into each of them. The importance of masterminds cannot be underscored enough. Both Jordan and Brian have been in several before, and currently are both involved in at least one group. Aside from the regular hotseat format that is fairly common, both Brian and Jordan’s masterminds have Slack groups that allow the conversation to continue throughout the week. This includes a Goals channel within Slack that helps keep them accountable in between meetings. Your mastermind should be with people that are in similar businesses, stage of your business, and areas of expertise. Some variety is important to get different perspectives, but too much draws away from the ability to contribute in each meeting. MastermindJam.com – Ken Wallace, co-host of the Nights and Weekends podcast has created a matchmaking service to help entrepreneurs find mastermind groups. Joining forums and Slack groups focused on your niche and network with other founders in your niche. Do some manual outreach to people you know and may be a good fit. Take the time to make sure everyone is in the same place in their business. When it comes to content production you have to keep in mind that the sum total of the content you produce is a really important factor in your overall content imprint. Specifically, The Startup Chat podcast had an episode on finding the content medium that allows you to easily create content, and spin it into different avenues for your audience. Is it video, audio, written, or podcasting? Choose the one that allows you to create content easily, authentically, and in a way that can get spun into different mediums. Brian is considering putting this into action within Audience Ops, in a behind-the-scenes way. Their internal planning meetings could be recorded, turned into a podcast, written up into a blog post, and laid over slides into a video. Being organized and productive is always a challenge for entrepreneurs. The list of things to do is endless, but Brian is finding ToDoist as a good tool to help keep the distractions out and staying focused on what really matters. Jordan favors Trello as his way of keeping tasks organized and prioritizing them. Tags and categories keep things straight and help stay focused on what’s really important for his business. Emails are the bane of anyone’s organizational existence. Keeping organization via email to a minimum is really important to maintaining your mental health. Those unread emails just nag at your mental energy, and minimizing those will help free your brain up to focus on what really matters. Keeping that balance, both physically and mentally between work and the rest of your life is something to really keep in mind. The tradeoff between success within your family and success for your business is a zero sum game. Improvements in one side of the business will result in a sacrifice of sorts in the other. To keep this in perspective, just remember that “These Are The Good Ole Days”. Reward yourself for the decisions you’re making, the opportunity you’re creating, and the journey you’re going on. This is the conscious choice you’ve made and try to embrace it. Don’t wait to arrive, because you may never actually be “done”. The journey is the destination. If you liked today’s episode, please give us a five-star review and we’ll mention your handle on a future episode of the Bootstrapped Web Podcast. Head here to leave a review in iTunes. Do you know which This Week in Startups episode that you mentioned? Or at least, what year that you heard that? Their back library is quite a look and that particular episode sounds intriguing. You mentioned an episode where Jason Calacanis talk to a class, where he described his evening when he finally sold Weblogs. He kept refreshing his bank account until he saw the money comes in and he literally cried.